Vitamin G being, of course, neat gin, a nutritious basic foodstuff for anyone over the age of 40. Or fifty. Earlier that morning, in a pre-party kitchen frenzy, I'd wrapped six tennis-ball-sized beetroot in foil and put them in the oven, with a view to making my beetroot hummous. When I took the parcel out of the oven at noon, I was feeling grumpy, footsore and frazzled, and wondering how the hell I'd feed the 40 people expected at the party, considering I'd made only three trays of hors d'œuvres (or horse-da-oovrays, as they are known in my family). But my mood improved when I opened the foil and inhaled the glorious scents of earth, water, stone and blood: what I craved, I realised on the spot, was a borscht (of corscht! ); very cold, with ginsk. And spring onionsk. If you've read this far down, you must be a lover of beetroot. And, if so, I don't think I need to sing its praises to you. Here's what Tom Robbins had to say about beetroot in his novel Jitterbug Perfume: "The beet is the most intense of vegetables. The radish, admittedly, is more feverish, but the fire of the radish is a cold fire, the fire of discontent, not of passion. Tomatoes are lusty enough, yet there runs through tomatoes an undercurrent of frivolity. Beets are deadly serious." You do need a good vegetable stock to give this soup some depth. In this recipe, the peelings of the baked beetroot are combined with basic vegetable flavourings to make a tasty broth. A big mistake I made, on the eve of this party, was that I didn't chill the soup for long enough. It needs to be very cold (but, then again, not so icy that it numbs your tastebuds). Next time, I'll chill the shot glasses in the freezer before I serve it. Preheat the oven to 180°C. Trim the leafy tops off the beetroot, leaving 5 cm of stalk intact. Wipe the beetroot with a cloth, but don't wash, peel or cut them. Wrap them in a double layer of foil and place in the oven. Bake until completely tender when pierced with a sharp knife (how long this will take will depend on the size and age of the beetroot; for baby beetroot, an hour is enough. Very elderly beets can take up to 3 hours.) Remove the packet from the oven and allow to cool. Put a piece of newspaper or greaseproof paper on your kitchen counter. Trim the beetroot of stalks and roots, slip off their skins, and set all these trimmings to one side. Quarter the peeled beetroot and place in the goblet of a liquidiser. Blitz until you have a fine purée (if the mixture is too thick for the blades to turn, add a little water). Pour into a large bowl and refrigerate. Now make the stock: put the reserved beetroot trimmings into a saucepan and add the remaining stock ingredients. Bring to the boil, then turn down the heat and simmer for an hour, topping up with water every now and then if necessary, and skimming off any foam. Strain the stock through a colander onto the chilled beetroot purée. Add the Tabasco sauce and season with white pepper, and a little more salt, to taste. Stir well. Now pass the soup through a fine sieve. Place in the fridge again and chill for two to three hours. An hour before serving, place the shot glasses and the gin in the freezer. Remove the soup from the fridge and stir in the cold gin. Put the soup into a jug with a sharp pouring nozzle and fill each glass almost to the brim. Add a spring onion to each glass. Serve immediately. This recipe makes 36 shots of 60 ml (4 T) each, or two litres of soup (which will serve 8 people, as a starter). Absolutely love that photo, wow! You sure you didn't knock that glass over on purpose? ;-) I haven't been very adventurous with beetroot, but you have certainly inspired me to try! Lovely post Jane and I think using the shot glasses is wonderful. Beautiful picture too!(!! )Oops, couldn't resist! I am afraid I did knock the glass over by mistake, and this enraged me, as I knocked it over a beautiful huge sheet of pure white paper. I was going to wipe it up, but thought: who is really going to care? (Apart from me, the arch-perfectionist?). Thanks for the comments my friends. Jitterbug Perfume is one of my all-time favourite books. 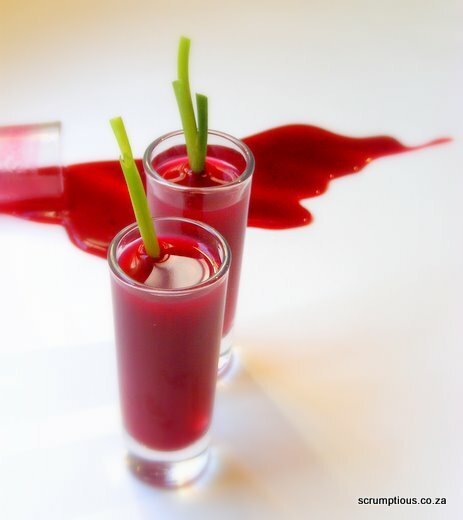 I have to admit though, my initial reaction to a beetroot shooter was not an incredibly positive one... (But then, as you may imagine, I'm not a huge beetroot fan.) I think I'd have to try it before I could imagine what it might taste like. Crikey, 11 out of 10 for originality though! Thanks Robyn - hope you do try this out. (If not, I will be forced to invite you over to try them out for yourself!). Dawn, how lovely to hear from you. Hope your granadillas arrive safely, and that someone at US customs knows what a 'granadilla' is! (A passionfruit, of course! ).